Another great author for you all this month. Everyone, meet Steve Harris. 🙂 Steve writes under the pen name of Steve Byrne (find out why in the interview below). Steve writes horror books. GREAT scary creepy horror books. Stuff that will give you nightmares. Steve currently has 3 books available…. SAFE HAVEN (prequel to Phoenix), PHOENIX, and SEARCH AND DESTROY. I have read SAFE HAVEN and PHOENIX. Loved loved loved them! They did what they were meant to do ~ scared me to bits! Be sure to check them out. SAFE HAVEN shows a small glimpse into what lies ahead in PHOENIX. Something is hiding in the woods in Vietnam. Something SCARY is hiding in the woods of Vietnam. Read them to find out what it is!! I haven’t read SEARCH AND DESTROY yet, and really looking forward to reading it. Steve took time out of his busy busy schedule to answer a few (LOL) questions for me. 1. Growing up, did you read a lot? Much of my childhood was spent reading, and it didn’t take me long to outgrow children’s literature. As soon as I was old enough to have an allowance (we call it ‘pocket money’ in the UK), I began to spend most of it on books (and the remainder on records). 2. What was your favourite childhood book? The kid’s books I was reading were too safe and cosy. There was something lacking, and I didn’t know what. Then, at the age of ten, I managed to blag myself into the adult library by forging my dad’s signature. I wandered around until I happened into the horror section and picked out James Herbert’s The Rats. I remember coming face to face with that beautifully lurid rodent on the cover and thinking I’d found that missing something. And by that I mean something more than just badass rats. Definitely. I began writing stories and comics of my own not long after I started reading adult novels. I used to buy Action, a British comic with thriller-type strips. The content was so violent that was it eventually banned in my native UK because of its corrupting influence on children. Although I was appalled that the government had taken away my favourite read, I was also secretly thrilled in the same way I was about punk music (which I was also discovering at the time). I was part of a counter-culture, and it gave me a strange sense of belonging. Later I graduated to 2000AD. I loved all of these inventive, slightly transgressive stories, and I’d write and draw my own pastiches. Because my drawing skills are non-existent, eventually I’d just write. Inevitably, the dark stuff began to leak into my schoolwork, and my proudest moment was when my English teacher wrote on one of my essays, “this is the most disturbing story I have ever read in my career as a teacher. Well done. 10/10”. 4. I have heard some authors call themselves “readers” over being a “writer”. How would you characterize yourself? I call myself a writer, because I write stuff. I was reading a hell of a lot of books, and finding there was something missing in most. The characters and situations didn’t resonate with me. They weren’t written for a working class youth on a run-down housing estate. If the sort of people I knew were featured in books at all, they were baddies, bit parts or pawns. So I began to write what I wanted to read, purely for my own satisfaction. 5. What type of book / author do you enjoy reading? his down-to-earth yet lyrical writing style. You really get the sense that he enjoys what he does, and that’s what drives him. The last book I read was To Usher the Dead, a short story collection by Gary McMahon. A thing of beauty from Pendragon Press that’s highly recommended. It’s an anthology of all the stories featuring his character Thomas Usher, the protagonist in the novels Pretty Little Dead Things and Dead Bad Things. Gary’s prose hits that perfect note for me—wonderful writing without the pretention. And he does his own thing thematically; he’s not scared to explore the downbeat, or things that really get under your skin. 7. Do you have a favourite book that you enjoy reading over and over? There are books I wish I had the time to read over and over! But there are so many great books out there, and I haven’t enough years left in me to get through them all. If I do re-visit, it’s mainly horror-thrillers from the 80s, when authors like Graham Masterton, John Farris, and Robert R McCammon were producing books that really did it for me. George RR Martin was writing sublime horror like The Armageddon Rag—and the book I’d visit over and over, Fevre Dream. If you haven’t read it, it’s a tale of vampires on a Mississippi river steamer in the 1850s, and for the duration of the read, you’d believe you were there. 8. What does a typical day of writing look like? I’m a single parent, so my daughter comes first. I have to hold down a day job, so it’s home from work, domestic chores, food on the table, washing up done, then playtime until she’s tucked up in bed. After that, I have an hour or so of time-wasting activity to switch my brain from functional to creative—social media, listening to music, that kind of thing. Next comes any necessary research. I love finding out things I didn’t know about my subject matter. It builds enthusiasm for the writing to come, and can also spark ideas that will create new characters or change the course of the plot. Lastly, I’ll sit down and write until my creative juices have dried up. On dry days, I’ll force myself to stay there and type something, anything. It feels like the writing equivalent of a bikini wax. 9. How do you relax and unwind after a full day of writing? If I’m lucky, I’ll have time to watch a movie and read a chapter or two before bed. I love movies as much as I love books. Although, as with books, I’m turned off by anything that’s trying to be too clever for its own good. I think that’s what it boils down to for me—simple storytelling above all else. 10. How long does it normally take you to write a book? Ideally a year. Phoenix took longer because of the sheer amount of research I had to do before I could write. I suppose I could write quicker, but I’m not an advocate of this NaNoWriMo thing where you sit down and commit everything out of your head onto paper in the space of a month. I prefer to plot, plan, look at the whole thing from different angles, inject in stuff I wouldn’t have known from the research I’ve done. I spend more time thinking than I do writing. 11. What made you pick the VIETNAM WAR as your backdrop for PHOENIX? 12. Loved the book by the way … Would make a great movie. Who would you like to see play Bram? Cassidy? Hoan? Thank you! I’m so glad you enjoyed it. As I say, I tend to write to entertain myself, so when anyone chooses to invest their time on something I’ve written, I’m honoured. If they get as big a kick out of reading it as I did writing it … well, that’s a lovely feeling. Actually, I’d love to see Phoenix the movie. I think Hoan would have to be played by Choi Min-sik, the Korean star of the original Oldboy. That one’s easy. Bram’s a little more difficult to cast. He’d need to be played by someone who’d be believable as both a waster and someone who could step up when the situation demanded—Matt Damon maybe. I see Cassidy as a little more suave, like Bradley Cooper. Kim simply has to be Devon Aoki (Miho in Sin City). Jenny, Kate Hudson. I’m warming to this—anybody got spare cash they’d like to invest in a blockbuster movie..? 13. What book / author are you currently reading? I’m re-visiting Swan Song, by Robert R McCammon, a novel set in the aftermath of a nuclear war. It’s even darker than I remembered. Good stuff. 14. Any new releases coming out soon? The next novel is in the pipeline at the moment, and it will hopefully be out later in the year. First as an e-book, and then inscribed upon the flayed flesh of a dead tree. It’s called Craze, and I describe it as a tale of black magic apocalypse. Imagine Dennis Wheatley meets Mad Max meets The Walking Dead. I always seem to describe my projects as a mix of film and book, probably because I’m in love with both art forms. 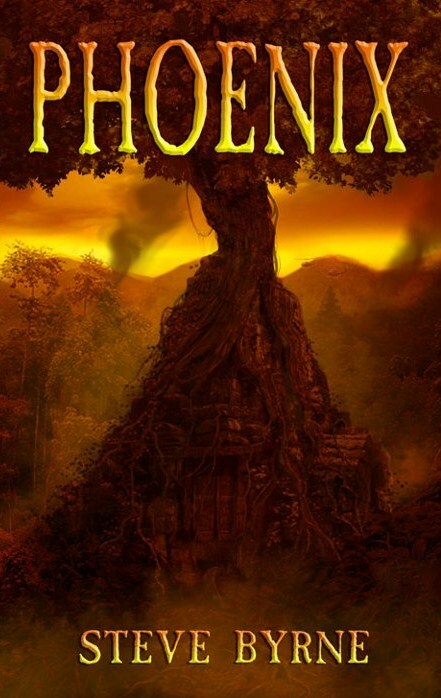 I always thought of Phoenix as The Stand meets Apocalypse Now. 15. When you are writing, do you like silence / music (who) playing around you? I produce a soundtrack for each of my books, and tend to listen to a certain type of music while I’m writing and researching to lock me into the right mood. As my writing is dark and violent, this tends to be dark, violent music—Punk Rock and Metal in all its forms. For Phoenix it was 60s hard rock—Hendrix, Free, Vanilla Fudge, The Stooges, MC5. For Craze, it’s Black Metal. 16. I’m sure more authors do it than I think, but why write under a pen name? I had no choice. I have a very common real name, and that was already taken by a rather good horror writer back in the 90s. To avoid any confusion I use my mother’s maiden name. I suppose I could add a middle initial, but I’d rather stand or fall on my own merit rather than be mistaken for another writer. It’s very inconvenient though. If I had the choice, I’d use my given name. 17. Any advice for a new author trying to break out? I’d say it’s our differences, not our similarities that make us special, so don’t be afraid to follow your heart and write for yourself rather than try to chase a trend. If writing is what you’re driven to do, never, ever give up. The accomplishment is in completing a work of art to your satisfaction. If it sells like hot-cakes, that’s a bonus, not a goal. here is my interview with awesome, amazing, wonderful, super duper, nice, handsome author STEVE HARRIS / STEVE BYRNE. Give his books and this interview a read. You wont be sorry! !